Contact thermocouples and RTDs are the most prevalent in temperature measurement applications. Thermocouples consist of two wires of different metals/alloys soldered together at two points. They deliver an e.m.f. which is dependant on the temperature and material used. Resistance Thermometer Detectors (RTDs) use the material's (platinum or nickel) change in resistance, to determine the temperature. Monitoring and controlling temperature is essential in a variety of process applications. In food processing and pasteurizing, the correct temperature of a medium ensures the quality of a product. Industrial automation applications require an exact temperature reading to protect against dangerous conditions and ensure safety. We offer temperature monitoring systems that provide reliable feedback in temperature control applications. The systems includes a variety of control monitors, RTD probes, thermowells, and adapters. High accuracy temperature RTD transmitter, directly in process, 4-20mA analogue output. The first switching temperature sensor with intuitive handling, combined with an excellent response time and a compact housing. Measuring range -25...140°C/-13...284°F and 2 switching outputs. Setting of the switch points using setting rings on the sensor, G 1/4 process connection, probe length 25 mm. Two available models. One (model 6130) with adjustable Hysteresis and another (model 7130)with Hysteresis fixed at 5 K.
The easy handling via two radial setting rings on the sensor enables quick and precise setting of the switch points for the users, also without system temperature being applied. Due to the possible mechanical locking manipulation is prevented. The protective cap, which can be obtained as an option, ensures protection against tampering. Over 50 new models of thermocouples and RTD sensors are now available in various sizes and configurations along with a complete line of accessories including various connectors, transmitters, and extension wire. Combining these sensors and accessories with our complete line of temperature meters and controllers, allows us to be your single source for all temperature measurement and control requirements. 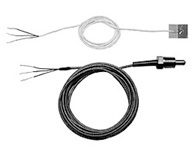 A series of quick disconnect temperature probes are available with both miniature and standard size connector terminations. These rugged probes feature a variety of calibration types, sheath materials and diameters, and are supplied with a mating female connector. Thermocouple wire and retractable cables can also be ordered separately. See the TMP QD range for more information. 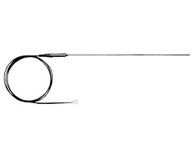 The TMPKTJ probes are transition joint probes featuring a spring strain relief at the "cold" end of the probe that prevents pinching of the thermocouple wire. They are available with a stainless steel, Inconel 600, or XL sheath material. The TMPTRN connectors are 2-wire connectors with built in signal amplifiers that convert signals to a standard 4 to 20 mA output. They are available for use with type J, K, and T type thermocouples and have an RTD compatible version available. See the TMPRT for surface mount RTD sensors, 1/4 NPT pipe plug RTD sensor, and mini connectors available for use with RTD sensors. A high temperature thermocouple, handheld utility thermocouple probe, and a spring-loaded compression fitting thermocouple are also available. See the TMPKC, TMPKU. TMPCN connectors are standard sized and miniature quick disconnect connectors, available in both male and female termination, and can be ordered for use with ANSI type J, K, T or E thermocouples. • Available in thermocouple types: K, T, J, N, E, R, S, B, C and D as simplex or duplex units. • Wide range of thermowell diameters, lengths and configurations. • Custom built to your exact requirements. • Wide range of attachment fittings available. • Wide operating temperature ranges (Suitable for temperatures up to 1600°C or higher). 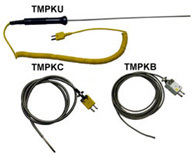 Model TMP Thermocouple and RTD Temperature Probes are field cuttable to the desired length. The probes can be trimmed to within 3.5" (88.9 mm) of the probe tip allowing for greater application flexibility. Accessory hardware is available to wire and mount the probes in the users existing thermowell. Optional spring loaded fittings (sold separately) slide along the probe sheath to proper immersion depth as determined by the user. These fittings allow for strong contact between the probe and the thermowell to improve response. The spring loaded fittings are adjustable and reusable. This connects probe to thermowell and attaches to weatherhead. This is the weatherproof head accessory for the TMP products. This is the spare tube sleeve for TMP products. This is the simplex terminal block for TC type TMP units. This is the three terminal block for RTD TMP units.